In the equation above, f(x) is the function and x is the moment arm. To better illustrate this, we will derive the y centroid of an arbitrary triangle with its base coincident to the x-axis. In this situation, the shape of the triangle, whether be it equilateral, isosceles or scalene is irrelevant as everything is relative to only the x-axis. Note the the shape is irrelevant if the triangle’s base is coincident or parallel with respect to the axis. This will not be the case when solving for the x centroid. Instead, you can imagine it as getting the centroid of two right triangles with respect to the y-axis. For the sake of convenience, let us imagine an isosceles triangle similar to the refernce table below. Finding the relationship of b and h will yield the following relationship. Below is a list of a variety of beam section shapes and the distance to the centroids of the section. The equations show how to find the centroid of a particular section from the base or the furthest left point of the section. For SkyCiv Student and Structural subscriptions, this reference can also be downloaded as a PDF Reference to take with you wherever you go. 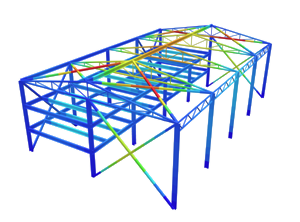 Centroids of a beam section are extremely important as they locate the Neutral Axis and are one of the earliest steps required when analysing a beam section. SkyCiv’s Free Moment of Inertia Calculator is a valuable resource to check the below equations for centroids have been applied correctly. SkyCiv also offers a comprehensive Summary of Sections Table which contains all the equations and formula relating to beam sections (moment of inertia, area etc…).